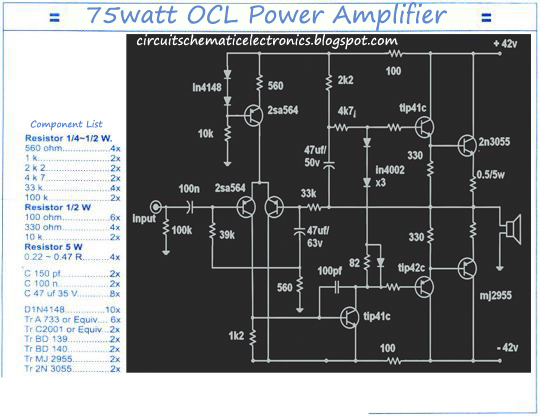 OCL power amplifier circuit used in this circuit is a power amplifier type of OCL (output capacitor Less) with a power output of 150 Watts [Stereo 15W x 2 = 300w]. The Circuit of 150 Watt power amplifier OCL works in class AB with symmetrical VCC voltage source of 25 volts DC to 32 volts DC [If the transformer wear CT18V up to 24V 5A]. OCL power amplifier circuit using a 150 watt power transistor complementary TIP 2955 / MJ2955 and transistor TIP 3055 / 2N3055. 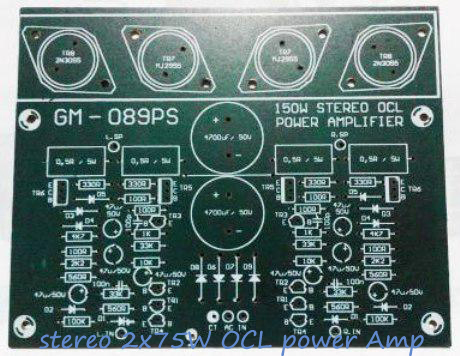 150 watt power amplifier in the circuit can be used to drive a load (4-16 Ohm loudspeaker). Power supply power amplifier circuit can use power supply circuit symmetrical current 5A. This Mono Circuit Diagram , if you need stereo you can multiply this circuit. PCB size : 11.5 cm x 15 cm Pertinax material and paint can be used circuit production / solder dip. To increase the performance and tone control, this stereo tone control circuit is suitable for power amplifiers above.